Earlier this year, the City’s administration convened the ‘Disadvantaged Business Enterprise (DBE) Program Review Panel.’ The panel, made up of eight members of the public, an alderman, and three City staff members, is tasked with the review of the City’s economic inclusion in procurement opportunities. “We recognize the importance and responsibility of awarding contracts to those businesses socially and/or economically disadvantaged, and it is the policy of the City to utilize disadvantaged business enterprises in all aspects of contracting. I look for this panel to review how well the City is implementing the policy.” — Mayor O’Connor. We recently caught up with DBE panelist Sue Hough – owner of Octavo Designs, a Frederick-based graphic design company. We asked for the inside scoop on her experience as a State-certified minority owned business and her vision for the panel here in Frederick. I’ve been a business owner in Frederick since 2000. My company -- Octavo Designs is a graphic design business that does both print and web. We create logos, websites, branding strategies, business cards, anything print-related … they said that print was going to die, but it hasn’t…, and most recently, we’ve been delving into packaging. Thanks to the internet, our clients can come from anywhere — but certainly the bulk of our work is in the tri-state region. We love when we get to work locally. I am officially a Maryland-state certified minority-owned business! I actually just did that last year… it’s taken me that many years to actually get around to completing the paperwork! Everyone told me I should certify. ‘Sue, you gotta do this --You gotta certify’, ‘You aren’t certified?’ ‘You should certify!’ I’d been hearing it for years, and from everywhere! A large majority of our work comes from the private sector so it didn’t seem as urgent to certify. But, ultimately, it was working with other graphic design firms who had done it that finally encouraged me to go for it myself. Well, to be honest-- It wasn’t easy. I will admit firsthand it can be daunting to a small business. To certify with the State you have to be established for a certain period of time. I obviously met that requirement because I’d been in business for forever. But, if I remember correctly, you had to provide several years of tax information and financial statements. That’s the big thing— they ask for a lot of back-up materials and for a lot of things to be notarized. It’s a lot of paperwork to track down. You can find all the necessary steps online, but it required personal research. And then - you have to re-certify every year. Thankfully, though, I can also say from personal experience, it does get easier the second time round! You know what to do, and becomes much less intimidating. Honestly, I can’t say yet what the impact has been. People certainly seem happy that I have it, but I don’t know if I can point to my formal position as a minority-owned business in any situation as a truly positive factor in the decision-making process. Admittedly, some of this could be my line of work. I don’t do as much work in the public sector as someone in, say, construction may. It’s possible in a different industry that the impact would be much more obvious. Where I have noticed it impact me most positively is that it has opened up more partnership possibilities with other firms. Some larger firms our company is looking to do work with, in turn, are specifically looking to meet contracting terms to include businesses like mine. In those cases, it certainly opens relationships. As far as my direct relationship with local government contracting opportunities as a minority-owned business, I guess that’s what we – the panel – are trying to figure out! Not too long after I certified with the State, I got an invitation from the Mayor to join the City’s DBE Panel. Our panel has been tasked with researching best practices and putting forth recommendations for the best model for our own municipality. It is challenging to try to figure out how to help the people who really need it. We are reaching out to other states and cities, and bringing in guest speakers to get a good grasp on the types of processes others have instituted to monitor & encourage economic inclusion. We want to make sure our local process is as clear, straightforward, and effective as possible, and that way across all demographics. I appreciate that the City has taken a step towards addressing the unique challenges some of our businesses face. It feels like people are really starting to recognize where there are gaps and Frederick, as a whole, is working to move forward to remove those. I am really grateful to be a part of the discussion and hope there are other small businesses that will benefit from our work. Interested in learning more about the City’s DBE Review Panel? 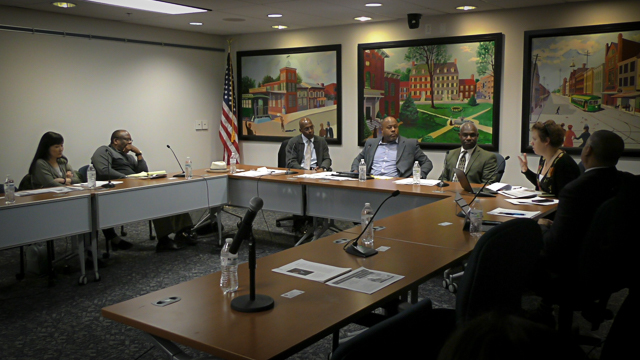 Or watch this clip from: the Disadvantaged Business Enterprise Speaker Series Held November 8, 2018 with Jerome K. Maultsby, Assistant Director, Office of Small Business Programs (OSBP), U.S. Army Medical Command, and Courtney Billups, Esq., Chief, Minority and Women's Business Opportunity Office, Baltimore City Law Department.